Scooby-Doo! 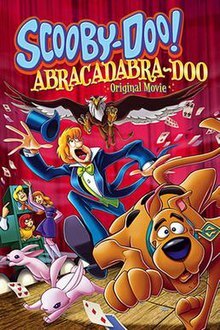 Abracadabra-Doo is a 2010 direct-to-DVD animated comedy horror mystery fantasy film, and the fourteenth entry in a reboot based upon the Scooby-Doo Saturday morning cartoons. The film is directed by Spike Brandt and Tony Cervone. It was produced in 2009 by Warner Bros. Animation and it was released on February 16, 2010. It made its television debut on July 10, 2010 on Cartoon Network The movie performed well on iTunes, reaching the Top 10 on the Kids & Family movie charts and the Top 40 on the iTunes movie charts. The DVD sold 61,341 units in its first week and as of January 2013, it has sold approximately 433,000 units. This marks the first Scooby-Doo animated movie to feature Matthew Lillard voicing Shaggy Rogers (having previously played the character in the 2002 and 2004 live-action films), as well as the first Scooby-Doo production since Scooby-Doo and the Cyber Chase not to feature original Shaggy voice actor Casey Kasem in any capacity. The animation is now in a different format, with a darker, more realistic look similar to Zombie Island and Witch's Ghost, and the characters are now in their original outfits and designs from the classic original Where Are You! series. After wrapping up their latest mystery, Velma gets a call from her mother asking that she check on her younger sister Madelyn, who attends a college for magicians. The gang heads to the Whirlen Merlin Magic Academy, located in an old Irish castle. Once they reach the castle they meet the owner, Whirlen Merlin, along with his brother Marlon, who acts as cook and butler, and Crystal, Whirlen's former stage assistant. The gang learns that a giant griffin has been scaring away the students and staff. Later that evening, Madelyn, who has had a crush on Shaggy for years, takes him on a romantic walk to in the gardens and show him an ancient sun-dial. Madelyn explains that the gryphon was meant to protect the school, but then the gryphon chases them from the garden. The rest of the students leave, so the gang starts taking classes themselves. Meanwhile, Calvin Curdles, a powerful ice-cream guru, continually offers to buy Whirlen's castle from him. The gang promises to investigate to see if Curdles is behind the Gryphon. Velma and Daphne stumble on a secret passageway leading to the attic of the school, where they discover that Alma Rumblebuns, the school's head maid, used to date Calvin Curdles. Meanwhile, Shaggy and Scooby discover the special effects room of the castle, where they are discovered by Ms. Rumblebuns and knock over some chemicals, creating a fog. Madelyn then finds a book about the ancient staff of O'Flannery, the original owner of the castle, which is said to control the gryphon. Even though Amos warns them that the island where the staff rests is haunted by a Banshee, the gang travels to O'Flannery's crypt and recover the staff, but they are chased away by the Banshee and narrowly escape. Afterwards, the gryphon quickly appears again. As the gang runs to the castle, Shaggy and Madelyn bump into Amos and misplace the staff with Amos' pitchfork. When Madelyn runs outside to recover the staff, she is kidnapped by the gryphon. Meanwhile, the gang finds out that Amos has been secretly working for Calvin Curdles to try to get Whirlen to sell the castle. While the gang goes to rescue Madelyn, and Calvin tries to convince Whirlen to sign over the castle. They get into the tower with the staff, but they are separated in the process when the gryphon attacks. Shaggy and Scooby are left alone while the others get help, and Shaggy discovers the staff is a key to the roost where they rescue Madelyn. But their reunion is quickly cut short again when the gryphon attacks but they are able to escape. Shaggy also throws the staff at the gryphon during the process, causing it to go out of control. Everybody else rushes outside including Curdles. The gryphon crashes to the ground, where they discover that it is actually a giant puppet, controlled from a blimp hidden by a fog machine run by Whirlen's brother Marlon. He had discovered that Lord O'Flannery had mechanical devices imitating a gryphon's beak and talons hidden in the Gryphon's Roost, hoping it would make everyone think a real gryphon lived there. Marlon fixed them, and used the devices to scare trespassers away. He was also behind the banshee, which was only a hologram. Tired of doing all the real work but getting none of the credit, Marlon decided to use his puppets and illusions to become a famous magician himself, but he needed money to start and the only way was to get Whirlen to sell the castle. So Marlon had his gryphon puppet scare everyone away. He apologizes for trying to make Whirlen fail, knowing how much the school meant to him, not wanting to take away his dream. Whirlen forgives Marlon, and all is well. Velma reveals that Amos found Marlon rebuilding the Gryphon and told Curdles about it. Curdles reveals he wanted to buy the castle to win back Alma's heart. Alma accepts him back and they become a couple again. The Merlin brothers decide to make Madelyn their apprentice and soon after Calvin Curdles sponsors the reopening of the Merlin Brothers' Academy of Magic, where Madelyn performs with Daphne acting as her assistant. An EP soundtrack was released exclusively to iTunes Stores in the US on September 14, 2010. Scooby-Doo! Camp Scare was released on September 14, 2010. ^ "Scooby Doo: Abracadabra-Doo: Frank Welker, Matthew Lillard, Mindy Cohn, Grey Delisle: Movies & TV". Amazon.com. Retrieved 2011-05-21. ^ "Scooby-Doo! Abracadabra-Doo". Turner Classic Movies. Atlanta: Turner Broadcasting System (Time Warner). Retrieved July 11, 2016. ^ "Scooby-Doo! Abracadabra-Doo DVD - Warner Bros.: WBshop.com - The Official Online Store of Warner Bros. Studios". WBshop.com. 2010-03-18. Retrieved 2011-05-21. ^ "Scooby Doo: Abracadabra-Doo - DVD Sales". The Numbers. Retrieved 2011-05-21. ^ "Scooby Doo! Abracadabra-Doo (Music from the Original Movie) - EP by Just For Laughs". 14 September 2010.